The Statistical, Economic and Social Research and Training Centre for Islamic Countries (SESRIC) launched the 2018 Edition of its Statistical Yearbook (SYB) on OIC Member Countries at the Fourth Session of the Annual Coordination Meeting of OIC Institutions (ACMOI) on 3 December 2018 in Jeddah, Saudi Arabia. 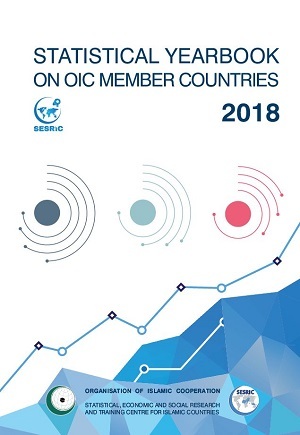 The SYB on OIC Member Countries 2018 delivers a wide range of internationally accessible and comparable statistics on broadly defined categories with the intention to provide digestible information across multiple socio-economic sectors. Prepared first time in 1980, the content of the following editions has been revised and enriched. In the 2018 edition, the Yearbook covers 20 categories with 277 indicators available for the period between 2000 and the last year available. The categories covered are Agriculture, Demography, Education, Energy, Environment, Gender and Family, Health, Industry and Manufacturing, Infrastructure, International Finance, Islamic Banking and Finance, Labour and Social Protection, Money and Prices, National Accounts, Public Finance, Science, Technology and Innovation, Tobacco Control, Tourism, Trade and Water. The 2018 edition of the SYB aims at serving as a reference publication for evidence-based decision making concerning possible areas of cooperation and integration at the OIC level and thus contributes to increasing statistical awareness among the decision makers in OIC countries. From this end, the SYB gives the readers the opportunity to see not only the individual performance of OIC member countries but also that of the OIC as a group vis-à-vis the World across selected indicators. Starting with 2019, the Statistical Yearbook (SYB) on OIC Member Countries will appear both as a fortnightly thematic statistical publication titled “OIC Statistical Outlook” to cover the categories hosted at OIC Statistics (OICStat) Database and as a final compendium at the year-end. Through this approach, the readers will be able to access the statistical analysis and tables with aggregate values rapidly by not having to wait the year-end.